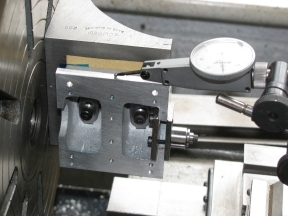 The lateral centreline needs to be determined before the end faces are finish machined (with the sump), so that the tapped holes for the centre bearing cap and sump can be located prior to final machining. Initial measuring up of the casting shows a considerable discrepancy in the lateral positions of several features. It is clear that if the mounting flange is left at the design width of 3″, it cannot be reconciled with other more important dimensions. 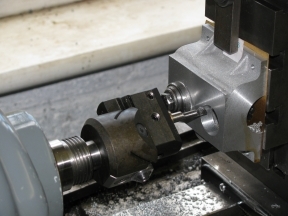 It may need to be reduced by something like an 1⁄8″ on the camshaft side to maintain symmetry while allowing an adequate amount of metal round the tappet holes. 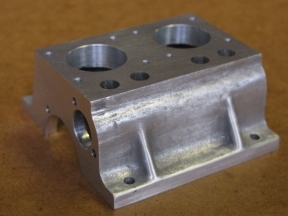 Detailed measurements of the casting will be needed as work progresses before the best datum positions can be decided upon. Externally, it does not look as if it will be possible to get the gussets equally positioned. The position of the breather boss is probably the most important feature to aim to centre. The cored holes for the cylinders seem to be offset a little and these will need to be checked carefully for sufficient metal to clean up. The crank race core holes also need to be taken into account, as there is not much latitude on the central web. Both end faces need to be cleaned up to enable a definitive longitudinal position to be arrived at. The breather boss is not to drawing. It has been altered to allow it to be cast without a core or loose piece, which would be OK, except that the top of the boss is rounded off and reduces the seating width. 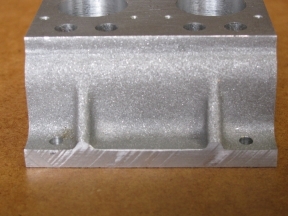 It is not wide enough to get the breather in without cutting into the side of the casting. This is consistent across all the castings in stock at Hemingway when I called. 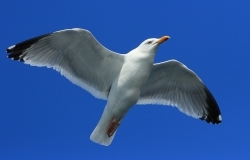 Several solutions have been explored, and the asymmetry of the casting has caused confusion. 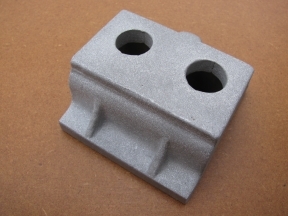 Initially it seemed it would be necessary to cut into the top face of the casting and set it considerably closer to the centreline than as drawn. 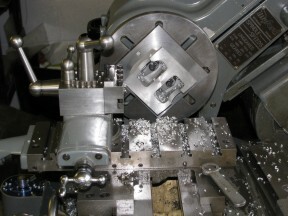 Another attempt showed that by lowering the height of the facing, the cutaway could be well clear of the top. 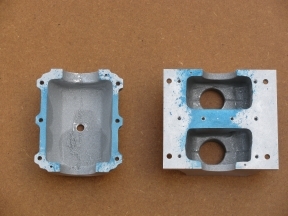 This will involve a redesigned filler to clear the side of the casting. The angle has also been increased, from 15° to 17° to ensure that the hole in the casting does not interfere with the central sump bolt. 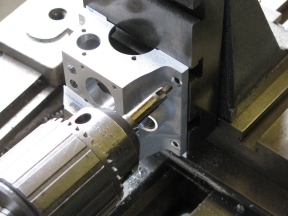 To machine it, drilling undersize from the bottom will establish the correct lateral position, then, working from the top, the longitudinal position can be verified from the boss. The face can be machined with a ½″ slot drill, followed by a boring head to create the clearance in the cut away, and counter-boring and tapping. 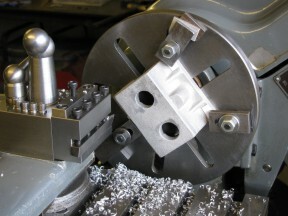 The edge above the breather boss should be used as the initial reference for setting up square. 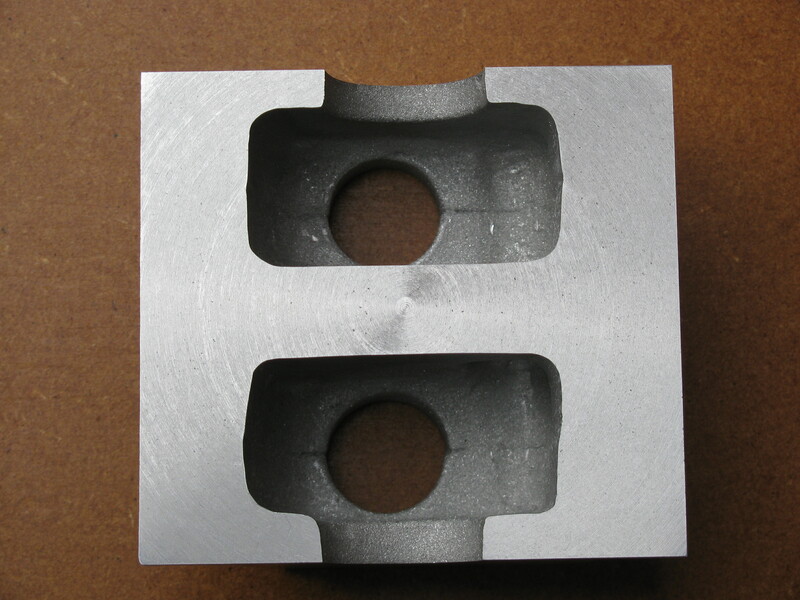 The cylinder flanges come quite close to this edge, so an uneven width of the margin would be quite noticeable. 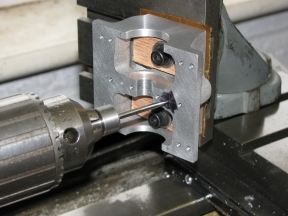 I see no particular reason why the end holes for the bearing housings need to be 11⁄8″ diameter. 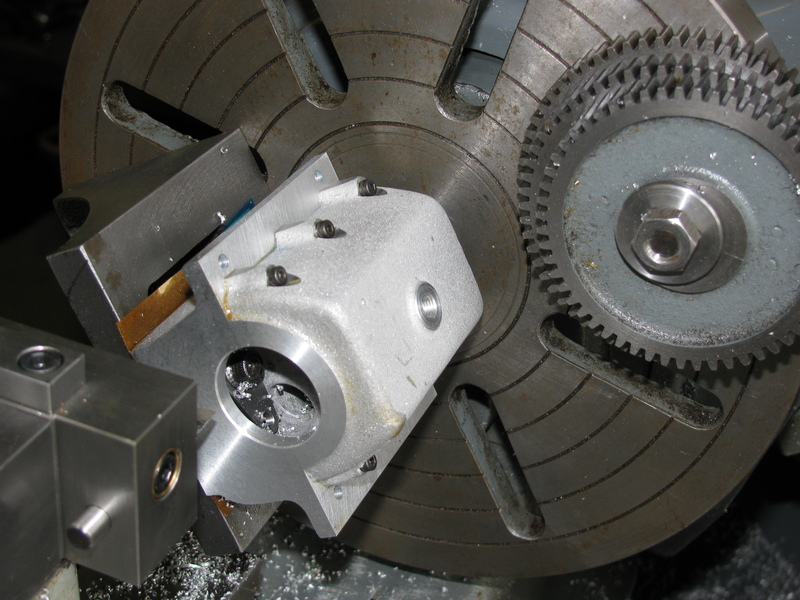 There is no need to be able to get the crankshaft through, so they could be smaller. 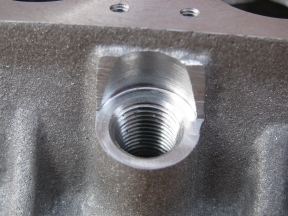 The bearing housing bolt holes appear to come extremely close to the bore at the timing end, and at the flywheel end it would be helpful to reduce the pitch circle so that the nuts do not overlap the edge of the bearing housing, for which the piece of bar supplied is to finished size. 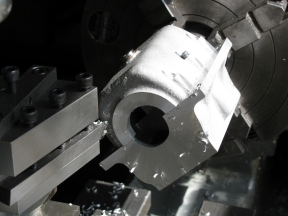 Reducing these bores to 11⁄16″ would do what is needed. 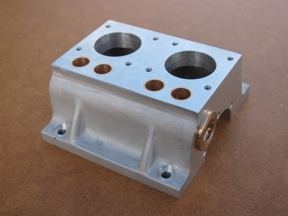 It will also allow a little more lattitude in positioning the crankshaft centreline. The angular position of the ring of holes at the flywheel end could usefully be altered to equalise the disposition about the cut-out in the flange needed to clear the camshaft bearing. 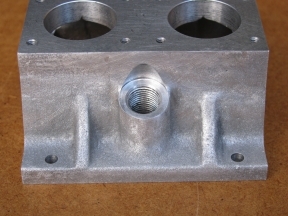 Particularly with the narrower mounting flanges, the 3⁄16″ Holes for 2BA engine mounting bolts seem infeasibly large, and a 2BA nut looks out of scale. A spot-face for a 4BA looks as though it would be more in keeping, and as probably the smallest of several possible sizes, this is what I will initially drill for. Moving the holes in from the ends by 1⁄16″ to 5⁄16″ also looks better balanced to me. Finding a best compromise position across the width of the flange is also difficult. 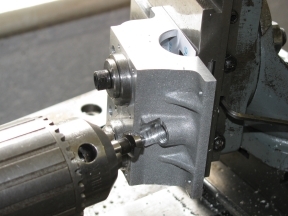 Too far out and the edge of the flange looks weakened, while too far in puts the hole too close to the outside profile of the sump. 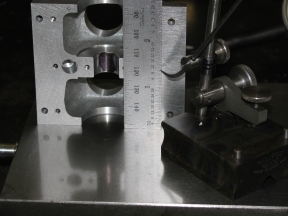 After fiddling about with filing and rubbing on a diamond lapping plate I decided the best way to get an accurate measurement of the thickness of the engine mounting flanges would be to take a trial cut. Set it up in the 4-jaw and took 35 thou off to clean up all over. Measuring up showed that, naturally, the worst discrepancy in thickness was across the diagonals and therefore impossible to correct. There was also some difference from side to side. 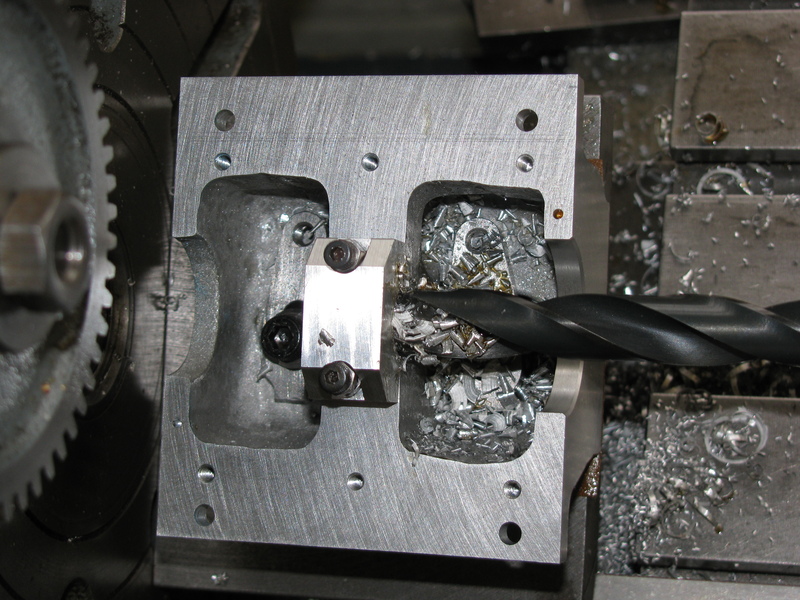 I set it up on the faceplate with 10 thou shim under the camshaft side, and took a light cut of about 15 thou to clean up the surface all over. 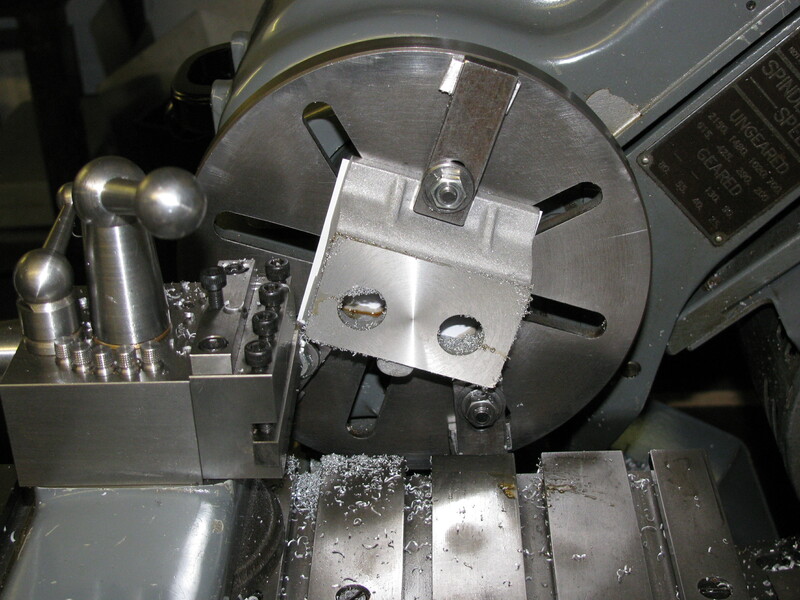 As the lathe turns a face slightly concave, as it should, I decided to scrape the outer face of the sub-plate flat. After I had done this I checked the thickness at the corners and found them off by a thou or so. Mounting the plate on the faceplate gave a similar runout. I tried carefully cleaning the spindle nose and faceplate mounting, and it was still off. So I put a clock on the faceplate and found a runout of 0.0012″. I did not want to re-face the plate, so I re-machined the sub-plate and marked both so that it could be mounted in the same orientation each time. 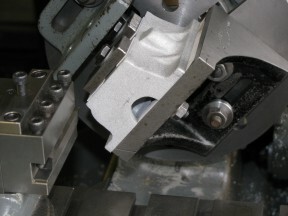 After tapping two suitably positioned M5 holes in the sub-plate, the crankcase was clamped on by the cylinder core holes and 30 thou taken off the bottom. There remains 46½ thou to take off. I decided to tackle the faceplate. 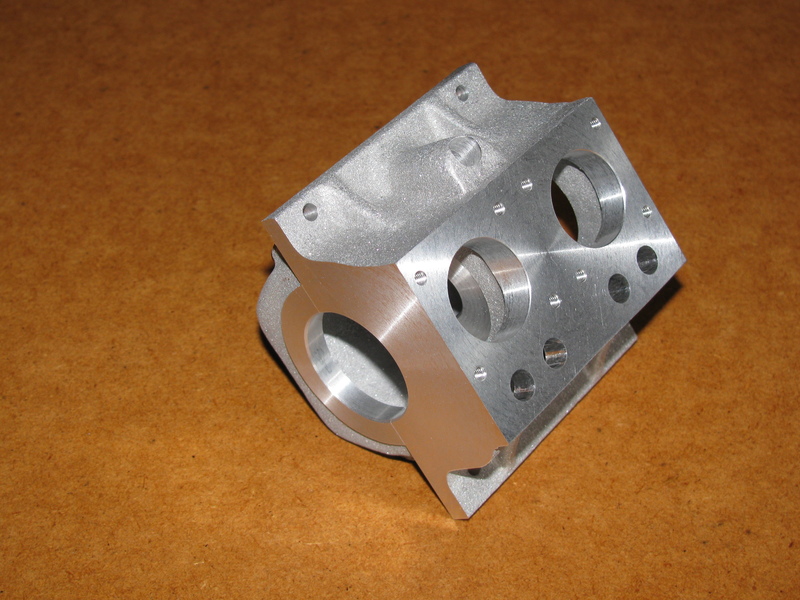 I took it off and carefully cleaned the spindle nose and bore and threads of the plate and re-mounted it. 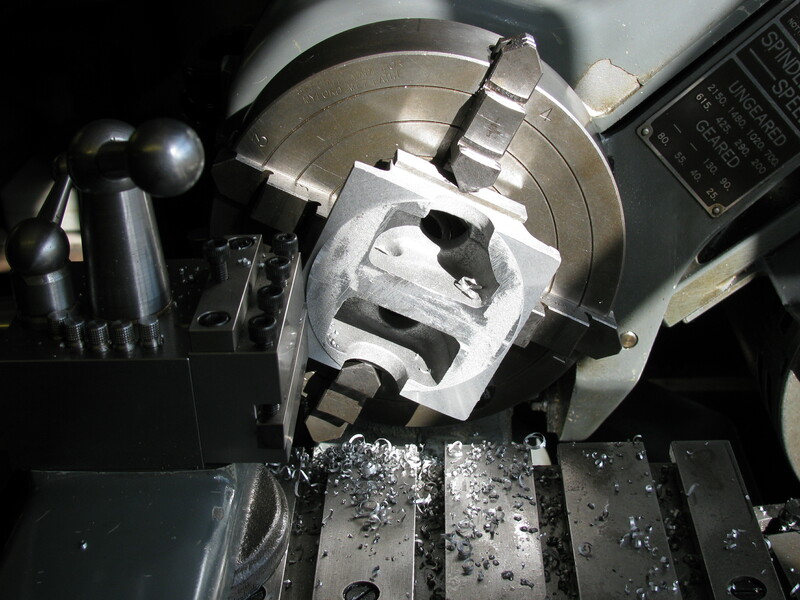 I then took a very light cut, about 2 thou across the face with a carbide tip, starting at 80 rpm and increasing in steps to 200 near the centre. An immediate check showed that there was now a surprising ½ thou runout at the rim. 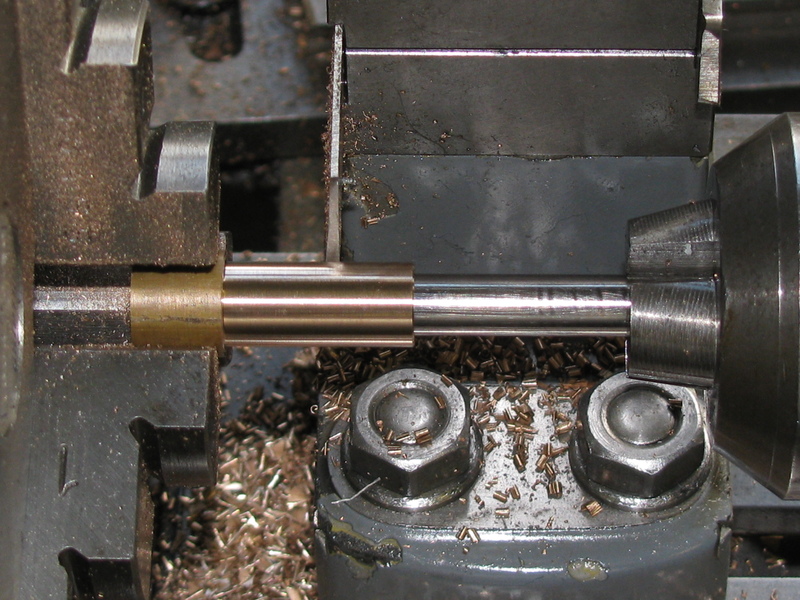 I decided to tighten the spindle bearings a little - it is not so long since I had it apart. Another cut resulted in minimal runout. Removing and refitting the plate gave a runout of ½ thou again. Trying again with careful cleaning and tightening it well reduced the runout to around a tenth. Evidently this plate is very sensitive to how it is mounted. The sub-plate will need machining again now. I set the crankcase up on an angle-plate for roughing out the ends. The top edge on the breather side was set square to the faceplate and a 40 thou cut taken on flywheel end. This was enough to all-but clean up along the top edge where the casting draw is greatest. 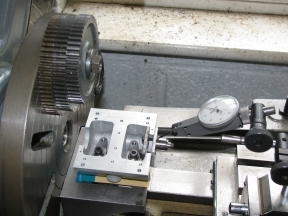 Turning it round and using a parallel between the machined end and the faceplate, two cuts of 40 thou were needed to clean up the timing end face. 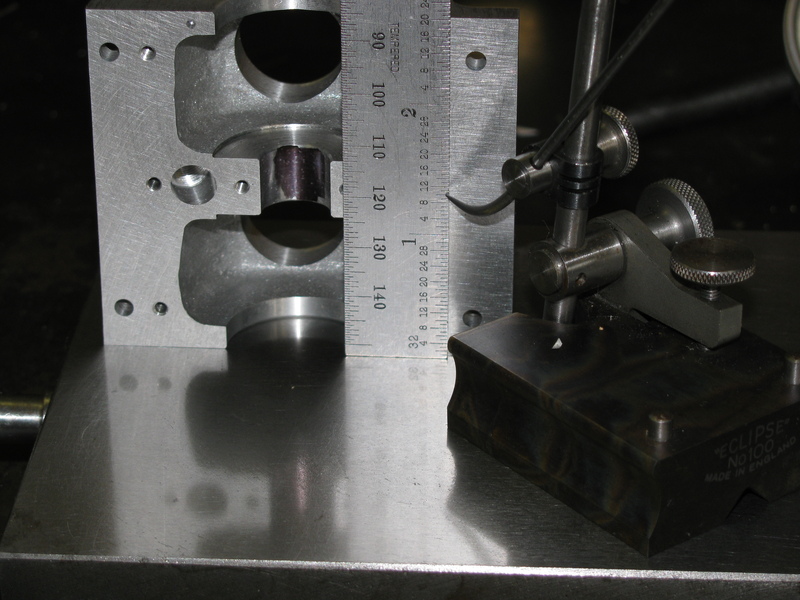 To get a datum for measuring up, I set it up camshaft side out, again using the top edge on the breather side as reference. A check on the camshaft side showed that this was running pretty true as well, and the machined ends were pretty good too. 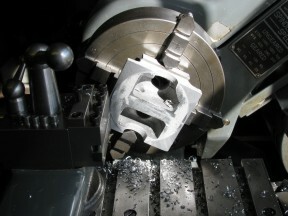 A cut of 20 thou maximum was taken to clean up the edge of the flange. After making some tee-nuts with M5 tapped holes for use with little clamping dogs, I set the crankcase up on the vertical slide for co-ordinate drilling holes in the underside for centre bearing cap, sump bolts and dowels, and engine mounting bolts. 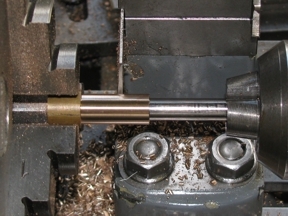 Rather than tapping these holes in the lathe, I used my tapping and staking tool. Having a fine tube on an air blow gun certainly makes it much easier to clean the swarf out of the bottoms of blind tapped holes. We now have an assembly! 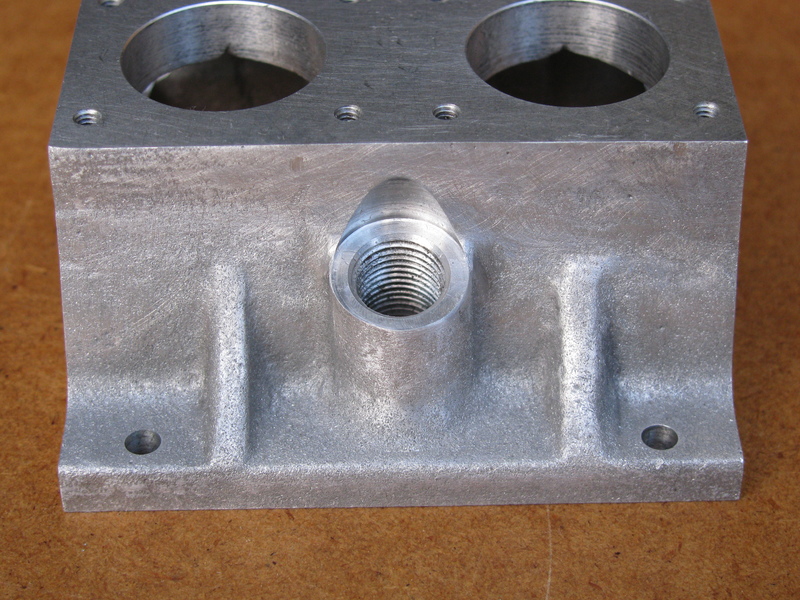 The holes line up well enough to get all the bolts in without difficulty, but with no play. Having decided to use the dowels to locate the sump, even though it is slightly out of position, 3 of the sump retaining bolts would not fit properly. Today I eased these holes using a needle file and a riffler until the cap-heads go in nicely. The sump is not marked for orientation, and could still be put on either was round. I need to remember that the small external blow-hole in the casting goes at the flywheel end. 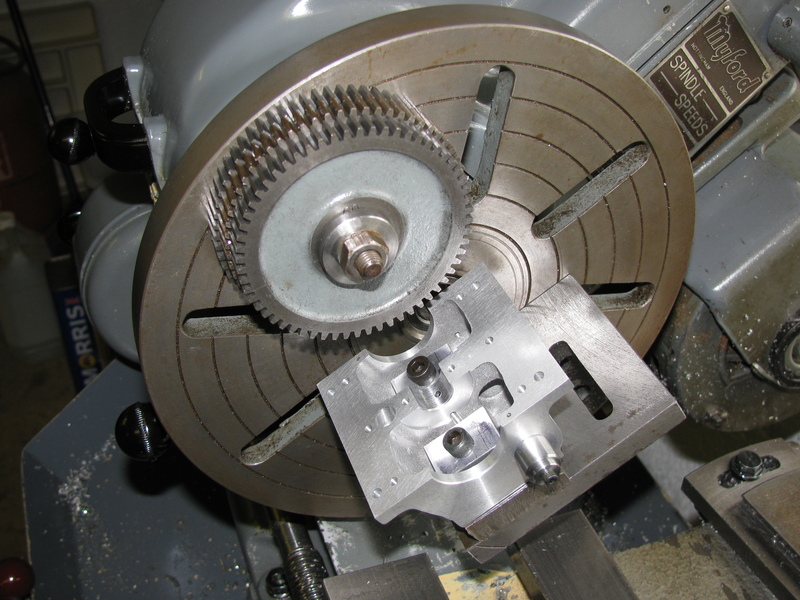 Having removed the burr I re-fitted the plates and button, which was then positioned using gauge blocks from the datum edge, and home-made, but fairly accurate, ¼″ parallel packers under the mounting flanges. 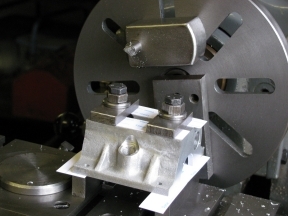 Mounted on an angle-plate on the large faceplate, the crankcase has to be clocked-up three ways, firstly a fore-and-aft check on the bolting face, as I know the top and bottom faces are not quite parallel. For the best work it would be a good idea anyway, in case there is any error in the angle-plate. I typically find I need a thin shim under the back end. 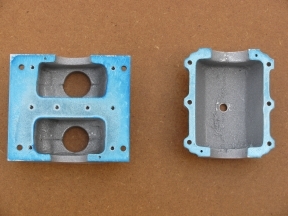 This is the blue material, from a pack of plastic shim from RS Components. Secondly, the datum edge is used to square-up the crankcase and finally the button can be set to run true. Actually I found this button, made I think from ½″ silver steel without turning the outside, not brilliantly round and hard to set true. Getting the angle-plate to move a tiny amount in the right direction can be frustrating. My lever DTI is has 0.01mm divisions, and I am not happy unless I can get within one division. After balancing the job with some weight on the faceplate, I made a final double-check that the crankcase was still square and bolted the sump in place. It needed about a thou feed to cut all round the end of the crankcase. I took 10 thou off, bored the hole to size and chamfered the outside. As the balance was not very good and the chipboard flooring is a bit wobbly under the lathe, I kept the speed down to 200 rpm. 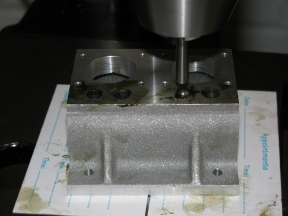 Judging from the surface finish of the cylinder register holes, I do not think I can achieve the result I want for the tappet holes with fine boring. The tappets need to be a pretty good fit if the holes are to last. I think a bored hole would soon wear to too sloppy a fit, which might continue to deteriorate rapidly because of the side load. At least with a flat-faced tappet the load is all one way. Equally, Westbury says the length of the hole is not enough for reaming, and I am not going to risk it. It occurred to me that a 'ballized' bore might be a good way to get a smooth, accurate, work-hardened hole in the alloy casting. 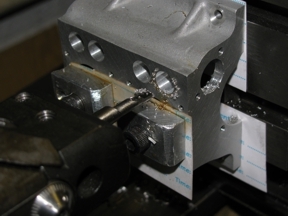 I tried carefully drilling a 6.3mm hole in a scrap of alloy and pushing a ¼″ steel ball through it using the drilling machine quill as a press. In spite of the 2 thou interference I measured, the ball went through easily, leaving a good surface finish with no galling and the hole still 1 thou undersize. I like the idea of a slightly undersize hole as it means that the tappets could be lapped to fit after hardening. 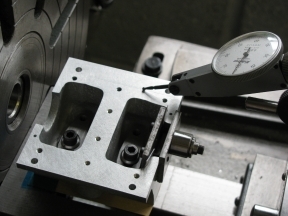 I found that cutting speed made little difference to the surface finish of the tappet holes, but made them as good as I could get, with cuts of 10, 2, 1 and ½ thou in each hole, taking the last cut at 80 rpm. 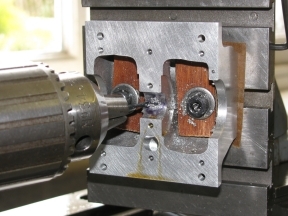 Still looking for every possible cause for misplaced bolt holes, I checked my 2.2mm 6BA tapping drill. The end was horribly blunt. All I have for drill sharpening is a Reliance grinding jig and, while it is pretty good on larger drills, 2.2mm is really too small for it. The result was no more than OK, so pre-drilling with a good smaller drill will be the order of the day until I get a replacement, or a better way of sharpening small drills. 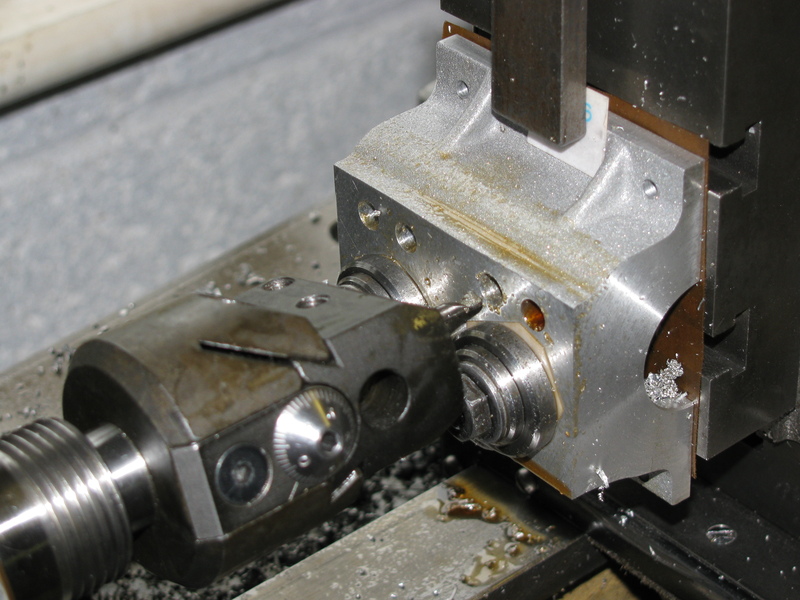 Once the drilling was done and the job removed from the lathe, I pushed the ¼″ ball three times through each of the tappet holes, using graphite grease as a lubricant. The result looks almost as if the holes were polished. I tapped the eight cylinder mounting holes in the Pillar Tool. Working on the oil filler hole from the top, I opened it out using a 5⁄16″ long-series end mill and cut the seating with a ½″ slot drill. I found that when slacking the locking screws on the vertical slide, for a traverse over the boss face, it moved a bit, making it a bit tricky to maintain a clean seating for the filler neck. Evidently the slide could do with adjusting. I also managed to forget the dial settings for the centre of the hole, which did not help. The pocket in the crankcase was opened up a little using the boring head, and the hole drilled, tapped and chamfered. Although I had to use a slightly undersize tapping drill, the tap went in very nicely. In planning the job I knew there would be some cleaning up to do on the casting, but had not really thought about the quite large 'wings' that would be left above the hole. These have been roughly filed down for now, and I will need to work out how best to blend in to the cast and machined surfaces. 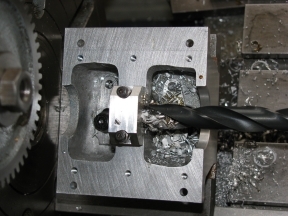 After the difficulty experienced in setting up the crankshaft hole with a toolmaker's button that turned out to be not quite round, made a new one for this job. I also made yet another pair of clamping plates for holding the casting without encroaching to much into the camshaft space. The button was positioned in the normal way with slips on the surface plate. That was the easy part of setting up. The first problem was to find a way of getting the button somewhere near on centre with more than one bolt holding the angle-plate on to the faceplate. In the end, I found I needed a thick packer between casting and plate. 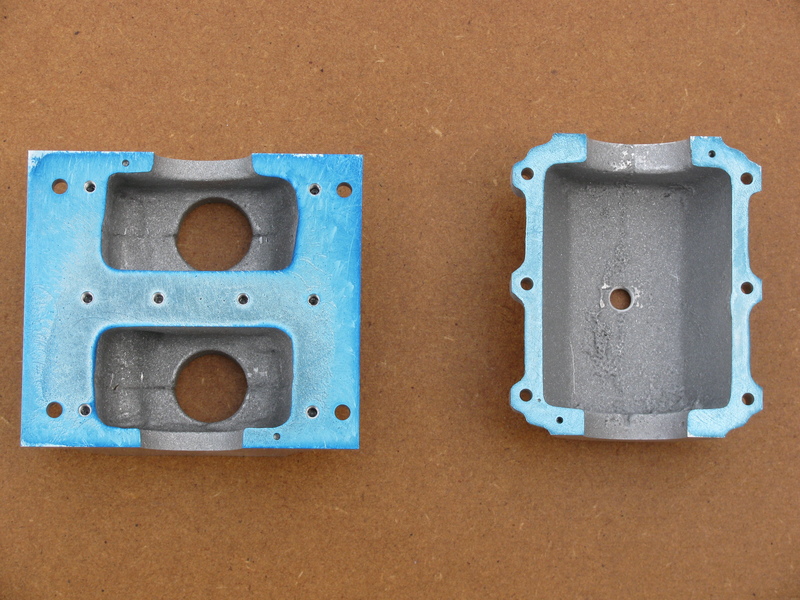 Getting the casting square both ways was not that difficult, but setting the button to run true was a right pain. 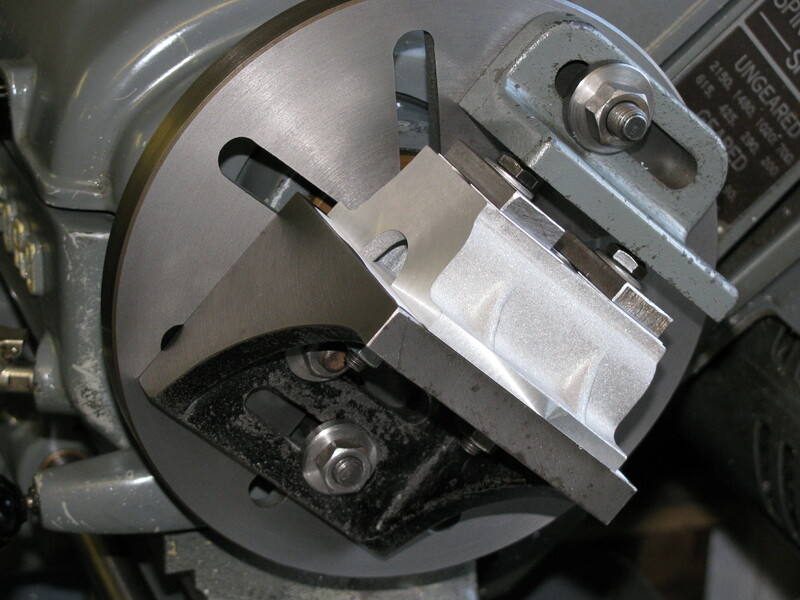 The blasted angle-plate just would not shift in the direction in which I wanted it to go. Most of my gentle taps made it move either not at all or far too far at right angles to the intended direction. Sometimes this is easy and sometimes it isn't. I don't know why. There are any number of ways to set the casting up for cutting the camshaft side mounting flange back to match the other one, but it seemed to me that the simplest was to bolt it to the boring table and fly-cut it. Machining the flange cut into the cast webs, and I needed to do some hand work, with files and wet-or-dry as before, to make the surfaces look like cast ones again. 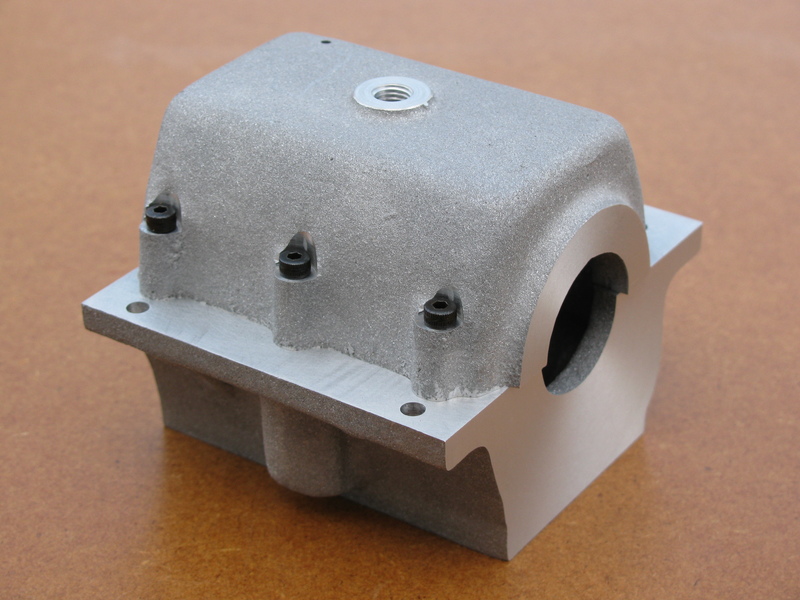 Satisfied that the casting was ready for sand-blasting, I started work on a box to protect the four machined faces from the abrasive, and made a stepped washer with a thin bevelled edge to protect the machine face of the oil filler hole. Later in the day I started work on the camshaft. The next job was to make the hole for the idler stud. This passes through the Timing Case and Bearing Housing, and a clearance hole is needed for the nut, lying on the joint between the Crankcase and Sump. This is described in the Timing-End Bearing Housing section. As explained here, the design tappet diameter is too small for the design cam profile, and the crankcase casting is not the ideal thickness at the tappet holes, so despite having carefully ballized them earlier, I have bored out the holes to 11⁄32″ and fitted 9⁄32″ bore bushes. As I was quite pleased with the way the holes had come out originally so I used each one as its own datum rather than trying to align on the (now sandblasted) datum edge of the casting. 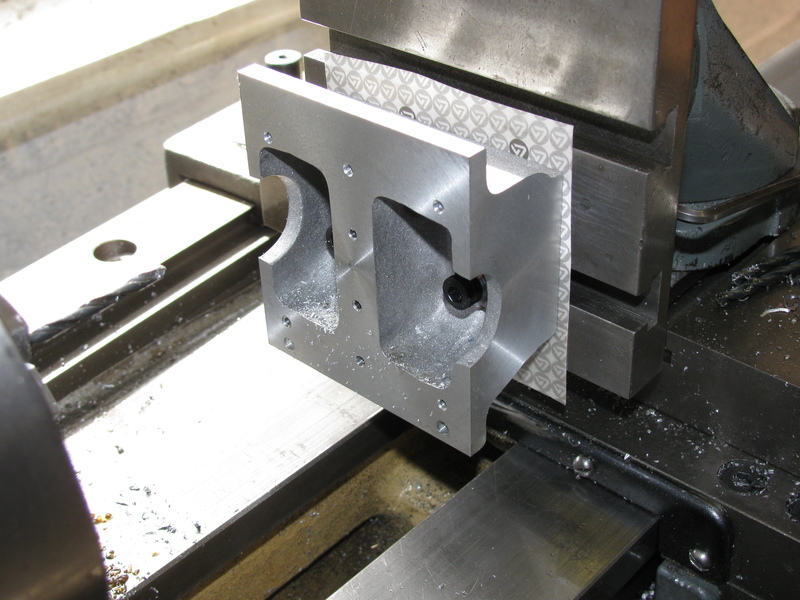 After clocking up and drilling out the bulk, I bored each hole to size using the boring head and creeping up on the final size with 0.0005″ cuts. The tool was cutting nicely and produced a good finish.